Within two minutes of sitting down, Andrew Savage leans forward on his elbows and begins to play mock narrator. “So here we are at East Japanese Restaurant in New York City,” he deadpans. “In front of us is an array — an assortment, really — of sushi. Beautiful on the eyes. Slowly rotating before us. Options aplenty.” He’s describing the fact that we — he and myself, as well as his bandmate Austin Brown — are sitting at a rotary sushi bar, having a conversation while staring forth into a middle distance of little plates of sushi topped by glistening plastic covers all drifting listlessly by, waiting to be chosen. At any given moment, if you go upstairs to use the restroom you can hear the echoes of drunken karaoke-goers at this modest hour of 7PM; at one point, a man with a heavy Japanese accent is giving his all to David Bowie’s “Modern Love.” Presumably, there is some purpose for us being here. After all, the reason we’re even meeting in this nondescript portion of Manhattan — on 3rd Ave., in the high-20s, more or less a no-man’s land of a neighborhood — is simply because it was the most conveniently located rotary sushi bar that Savage could find. And, as it becomes readily evident, Savage rarely does anything without intent, without premeditation and knowing exactly as he wants to see it come to fruition. Savage and Brown make up half of Parquet Courts, the rest of the lineup being rounded out by bassist Sean Yeaton and Savage’s younger brother Max on drums. At 22, Max is the youngest of the group, the rest of whom are 28; he’s absent tonight studying for NYU finals, while Yeaton is occupied with visiting family members. Collectively, they’re that band you’ve likely seen referenced as some variation on “slacker Brooklyn punk stoner dudes” in the wave of music media attention they garnered when their second album, Light Up Gold, was re-released by What’s Your Rupture? in early 2013. (Though, for most intents and purposes, it was their first to many people, seeing as 2011’s American Specialties was an extremely limited, cassette-only release initially.) Savage and Brown are aware of how they’ve been portrayed and, clearly having a lot of thoughts on how the media and art interact in 2014, are actively trying to correct the story tonight. Both speak with a measured, occasionally intense manner. Savage — whose hair has grown out into frenetic curls shooting up, out, and then down around his face — has a particularly focused cadence, his eyes dark and focused and staring out into nothingness when expressing a complex idea. “I want to talk about Sunbathing Animal,” Savage says at one point at the end of a particularly long discussion of where the band have arrived in their career. That’s matter of fact enough, considering the whole reason we’re meeting tonight is because Parquet Courts are about to release the crucial “follow-up to your breakthrough album” of their catalogue. But it’s also something of a mission statement, an alert that Savage and the rest of the band are ready to move past the various baggage they accumulated around Light Up Gold, whether it’s the stoner thing or the New York thing. Accordingly, the album in question is harder and denser than its predecessor. It requires more time to work your way into, and winds up feeling more vital as a result. “The album has some themes and a lot of recurring motifs,” Savage explains. “A few of the main ones are represented in the song ‘Sunbathing Animal. '” Combined with “Duckin And Dodgin” and “Black And White,” Savage considers it the “conceptual core of the record.” Together, they get at one of the major concerns of Sunbathing Animal: the idea of unbreakable cycles. Given the band has been touring and working steadily since their name came to prominence last year, it feels necessary to at least ask if this rhythm influenced the themes Savage became preoccupied with. “You’re not the first one to want to make those ends meet,” he says, seemingly already a bit wearied by the notion. Quickly dismissing the idea of being in a band and then writing songs complaining about being in a band as bad form, he goes on to explain that the concept is much more abstract and elemental than that. Returning to the image of his cat, Savage relates the mixture of pleasure and captivity to a pattern in his pet’s behavior. “That was the spark of inspiration to explore free will and freedom,” he says. Like the binary of beauty and ugliness that has fascinated him in the past, dualities like this loom large on Sunbathing Animal. Speaking of new paths, or lack thereof, it all keeps coming back to that sushi belt. For Savage, quoting the blues meant finding “a device to reiterate the power of feeling trapped and being in a cycle, not unlike this sushi belt here.” At another moment, he makes it personal. “I often wonder myself: How long can I work within the medium of rock music before I feel like it gets too tired? I know inevitably that will happen. I hope it doesn’t happen for a while. Sometimes I feel like I am one of these pieces of sushi on this belt wanting to find my way off, or else I’m going to just keep doing this forever,” he says. There’s still that measured delivery, and it’s difficult to tell whether he’s messing with me, making a joke of the sushi-as-metaphor, or whether this is exactly why he chose this place and this is a crucial image to him, or whether he chose this place precisely so he could deadpan about sushi-as-metaphor. “Cycles are an important part of Sunbathing Animal, because we all find ourselves in them,” he finishes. And that, there, he’s serious about. So, that New York thing. Aside from the fact that Parquet Courts are based in New York, the fixation on them as a New York rock band seems almost entirely rooted in “Stoned And Starving,” the centerpiece of Light Up Gold, probably their most beloved song, and yet more or less an outlier in their work. (It’s also the one that the stoner-rock association can be most directly traced back to, and it’s probably not a coincidence that those two strands emanate from the same place.) In fact, it really comes down to one line: “I was walking through Ridgewood, Queens/ I was flipping through magazines.” It might be one of the great opening lines of the latest installment in the canon of Great New York Songs. And, as it goes when a narrative develops around a band, it may forever remain a reference point, something that may have set Parquet Courts on another of those unbreakable cycles, of having people like me ask them about it. As much as their being a New York band has been used as a potentially reductive force in Parquet Courts’ young life as a band, the reason I return to the idea is that it seems a crucial element of their music. “The things I find interesting are in the margins of life, more in the minutiae,” Savage says at another point in the conversation. That sensibility is what ranks Light Up Gold, and potentially the rest of their music, amongst the best New York music produced in recent years. 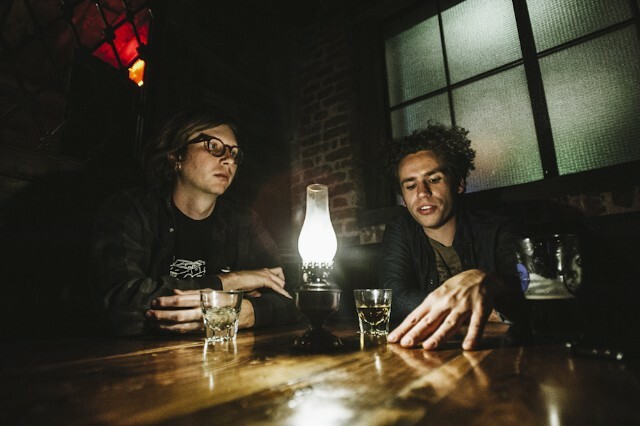 Parquet Courts don’t write sweeping anthems or odes to the mythic greatness of the city. They write about the stupid little things you do on the weekend, or they don’t write about it at all — they craft music that is frenetic and caged-in as much as it is wandering and at times delirious. It welcomes the banality that comes with being a young person in New York these days. While Light Up Gold was a great album to wander around the city listlessly to, Sunbathing Animal takes it somewhere else — and, as it goes with many of the ways in which Sunbathing Animal differs from Light Up Gold, it’s somewhere more challenging. There are recurring bodily images on the album, from the opener “Bodies” (“Bodies made of/ slugs and guts”), to “What Color Is Blood,” to “Sunbathing Animal” (“I now can hear my pulse alone/ This manic pace I cannot slow”), to standout “Instant Disassembly” (“I feel a pain so acute/ Like I’m being impaled/ And I can’t breath/ it’s hard to inhale”). If you read this through the lens of how their music reflects and interacts with New York, it’s a darker take than the sardonic wanderings of “Stoned And Starving.” It’s a reckoning with the disassociation from yourself and your physical existence when you live in a large city. Fundamental to life in New York — or, let’s call it any city — is that same sensation that underlies “Sunbathing Animal”: that you’re stuck in an unbreakable cycle of something you find pleasurable, but that also controls you. That duality of freedom and free will. That’s not “Empire State Of Mind.” It’s worth talking about Parquet Courts as a New York band still. They have something to add to the canon. After everyone’s had their fill of sushi, we wander downtown and wind up in a bar near Union Square that’s fine, if not memorable. We’ve traded in one mundane locale of Manhattan for another, which feels like Parquet Courts’ particular New York sensibility being put into practice. To that end, “Sunbathing Animal” occupies the same sequence position on Sunbathing Animal as “Stoned And Starving” did on Light Up Gold, and works as a totally different kind of centerpiece. It’s frothing and unnerving where “Stoned And Starving” unfolded in its ragtag krautrock way. Rather than a down-to-earth story-song, it’s confrontational. “People love that first song on the B-side, so I’m going to give it to them,” Savage says wryly. The movement away from hooks is intentional. “The whole band thought Light Up Gold was a lyrically forward record, and I think that maybe some people missed that, because there are a lot of catchy tunes on there,” Brown explains. While lyrics are always fundamental to Parquet Courts’ music and often come before the song itself, Sunbathing Animal was crafted in a way that allowed the band to push the words to the forefront. “It’s still music, but if you’re not listening to the lyrics you’re not hearing the whole song,” Brown continues. It goes back to what Savage had said about the tight repetitions intended to represent the theme of cycles. He describes how by making the music more minimal and restrictive, it frees he and Brown up to do more as vocalists and lyricists. “Aesthetically, I feel like it’s either an evolution or a progression, but the writing is deliberately the next step into showing what the band is,” Brown says. “It’ll be hard for people slap the ‘stoner/slacker’ thing on this record,” Savage adds. So much of the thought behind Sunbathing Animal is a willful rejection of what had been said about Parquet Courts in the last two years that it’s not hard to see how this could terribly backfire, if the band distanced themselves too far from the elements that made their music exciting in the first place in an effort to regain control of their story a bit. Luckily, Sunbathing Animal does sound like a progression — one that pushes deeper, more incisively. And, well, maybe that is indeed a mechanism through which Parquet Courts wants to rewrite their story a bit. Maybe it’s an issue of wanting to break out of some cycle or another. Either way, Parquet Courts aren’t messing around, and they want you to know it. Sunbathing Animal is out today on What’s Your Rupture?/Mom + Pop.